Today, mobile dominates the lives of many people. It seems that we can't live without a mobile phone. Mobile phones make communication easier and better now not only with text or call but with different chat applications and world wide-web service. And because of this great demand, it's better to choose the best mobile network that will cater all these services! It's a good thing that there is the so-called Globe GoUnli30. 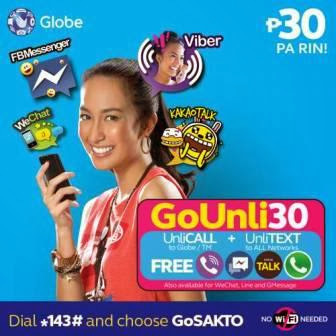 With GoUNLI30, subscribers get unlimited texts to all networks, unlimited calls to Globe/TM, and unlimited chat with the best messaging apps like Viber, Kakao Talk, Facebook Messenger, WhatsApp, WeChat, Line and the telco’s very own messaging app GMessage without the need for Wi-Fi or additional data charges. Available for only P30 valid for 1 day, GoUNLI30 gives you no excuse to stay out of the loop and connect with more than 1 billion users around the world regardless of mobile network or location. Therefore, Go all-out unlimited with GoUNLI30 and UNLICHAT25 now. Register by dialing *143# and then choosing GoSAKTO on your Globe mobile phone or texting GOUNLI30 or UNLICHAT25 to 8888. First it fulfills my chat habit. It keeps me connected 24/7 online with friends without worrying that I can't reply to their chats, messages, or tweets since I'm in real UNLI service. Second, it's truly affordable! Imagine, with ONLY 30 PESOS, you can totally browse the internet and stay connected whenever, wherever! You can chat, upload videos, share pictures, reply to tweets, send emails, or post pictures in Instagram Unlimited 24/7! As they say, sky's the limit! And most of all, it doesn't need a wi-fi! Yes, you can bring young android or smart phones wherever you will without worrying that there's no wi-fi to connect to. The wi-fi, the hotspot is already on your hands! You can even share your hotspot to your friends or love ones if you want to!